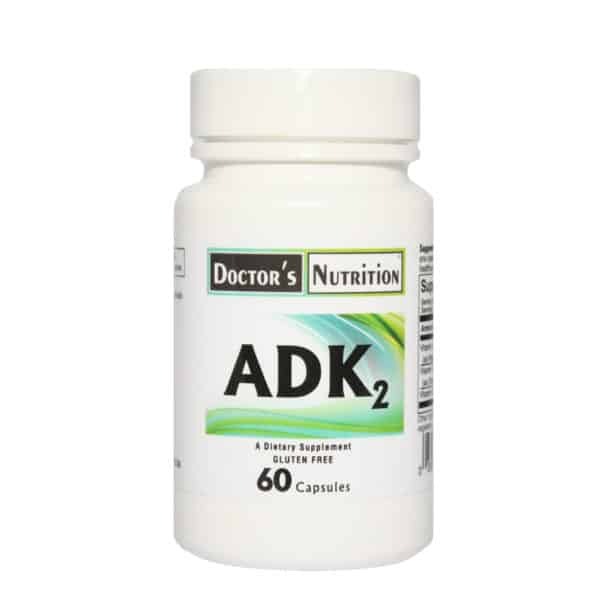 ADK2 is a dietary supplement that supports: Bone structure, density and integrity. Proper bone remodeling, Calcium utilization, Cardiovascular Function, Vitamin A is a fat-soluble vitamin with multiple functions in the body. It is required for normal development, growth and maintenance of the skeleton throughout life. Vitamin A supports the number and activity of osteoclast cells which break down bone tissue, an ongoing process of skeletal maintenance called bone remodeling. * Bone remodeling is a natural way the body removes old or weakened bone tissue in order to make room for new, stronger tissue. * This process is critical to fracture repair and retaining bone density. * Vitamin A also plays a role in stimulating osteoblasts (bone building cells) to secrete proteins that are required for bone mineralization, including the K2 dependent protein called osteocalcin. Combined, Vitamins A and D support osteocalcin output and the regulation of osteoclasts (bone breakdown cells) and osteoblasts (bone building cells). * Vitamin D3 (cholecalciferol) is a fat-soluble vitamin that is essential for maintaining normal calcium metabolism. It supports calcium absorption in the gut and helps maintain adequate serum calcium and phosphate concentrations to enable normal mineralization of bone. * Vitamin D3 is also needed for proper bone growth and bone remodeling by osteoblasts and osteoclasts. * Without sufficient Vitamin D, bones can become thin, brittle, or misshapen. Research shows that K2 partners with Vitamin D3 to inhibit the production of osteoclast cells (cells that break down bone) in order to help bone-building osteoblasts catch up to maintain a healthy balance. Vitamin D3 also supports cardiovascular function and blood pressure within normal ranges. * It impacts heart health by supporting the body’s natural cytokine production and vascular function. * Vitamin K2 known as menaquinone (MK- 7) is the form that has been shown to support normal bone formation. * It is responsible for the carboxylation of specific bone proteins that play a regulatory role in bone metabolism. * For example, Vitamin K is required for the activation of osteocalcin a Vitamin K dependant protein that transports calcium from the blood to form a healthy bone matrix. 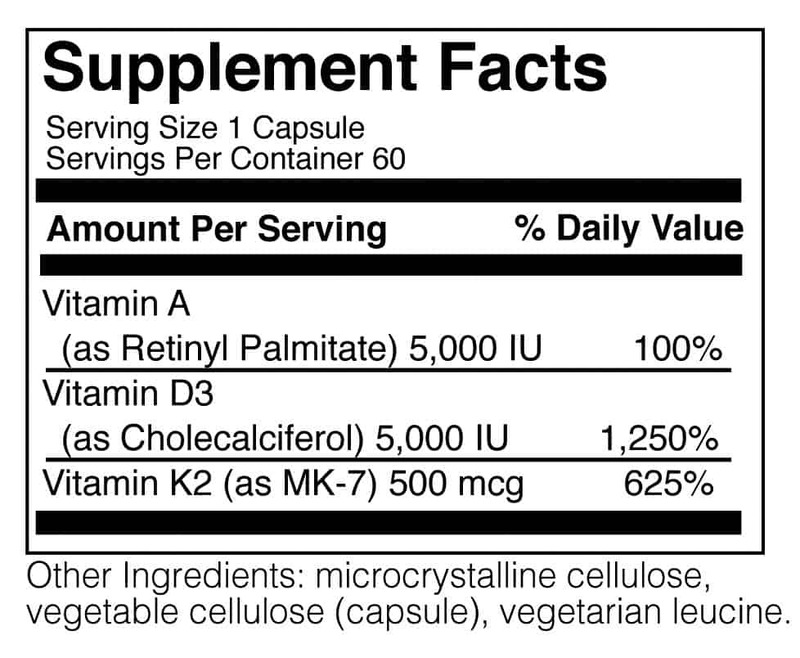 When Vitamin K2 is deficient or not well used in our bodies, bone structure and function can be compromised. * Vitamin K2 not only supports the deposition of calcium into bone, it also has a regulatory effect on Vitamins A and D with regard to osteoclast and osteoblast activity. * Factors that cause a Vitamin K deficiency include: poor diet and the use of certain prescription drugs, as well as long term use of antibiotics. The benefit of Vitamin K2 versus K1 is that it works primarily outside of the liver in bones and blood vessels. In blood vessels Vitamin K helps to maintain arterial elasticity.